« FALL 2013 IS HERE! This will be the fashion event of the year! We’ll feature a fashion show with incredible new collections never before seen at Aphrodite such as Sarah Pacini from Italy, Desigual from Spain and Free People from Los Angeles,The crowning glory will be the new collection from Peter Bauer, one of Canada’s top jewellery makers who resides among us in Cape Breton! We all come together because no matter our gender or race, age or ability, every one of us is a creative being. What we wear, the words we choose and the songs we sing, how we act and interact with each other – these are all expressions of our personalities and our ways of being in the world. And such creative expression can deeply affect our health – of our bodies, minds, and spirits. This afternoon of art and fashion is in the cause of health – of ourselves and of our community. Foster creative expression for community health – six words that capture the ancient and modern connection between our universal desire to create and to appreciate art and our personal and collective health. This is the mission statement of Arts Health Antigonish (AHA! ), a groundbreaking collaboration between GASHA Public Health and our local and regional artists and arts community. We’ll ask you to contribute $10.00 at the door so you can help advance the good work of Arts Health Antigonish . As part of this endeavour, we plan to establish the Arthur Rivoire Memorial Fund in memory of Carol’s late husband, who understood so well the natural alliance between art and health. The fund will further projects by AHA! for the health of our community. In exchange for your contribution, we’ll offer you tea and treats for you to enjoy while you watch our fashion show and enjoy the ambience of music and local culture. 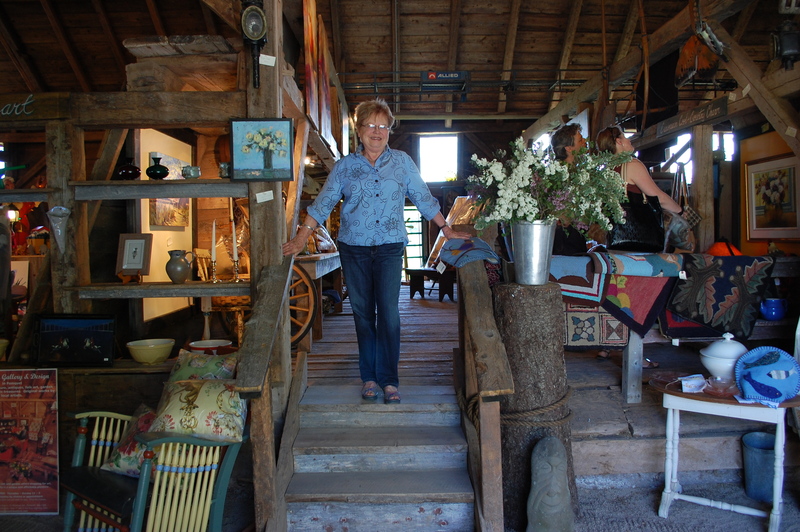 The Old Barn Gallery is located minutes from Pomquet Beach, a spectacular natural asset to our environment, amidst a display of artful treasures collected by CarolRivoire and her late husband, Arthur. Along with art, antiques and rustic furniture made in the gallery’s workshop, Carol and Ed Mattie (resident artist at OBG) are proud to feature the work of many local artists – some well-known like Joe Arsenault and Guenter Burr, and others rising names in Nova Scotia art. The Old Barn Gallery and its gardens are available for specialized occasions, such as this exciting afternoon of fabulous art and fashion. in order to help us be ready for the right number of people. Thank you for your kind invitation. I regret to say I will be out of the province on that date. Wishing you the best for a wonderful event!